Through his wife Elaine, Matt Scudder is introduced to a young woman being stalked and threatened by a former client of hers. Without a name or photo to go on, can Matt track him down and scare him off? Having believed to be done with Scudder, Block surprised us all when he announced a new novella featuring his titular sleuth. This would not be a flashback entry like A Drop of the Hard Stuff, but a present day story that catches us up with Matt as he hovers near eighty. Full disclosure: Lawrence Block sent me an advanced copy for review. While I happen to get dozens of complimentary books each year to read, it will never cease to amaze me that I receive books directly from one of my favorite authors. With the release of The Sins of the Fathers back in 1976, it’s been forty-three years since Matt’s first story. So is he showing signs of age? Sure, Matt’s a little slower and he’s been dealing with a recurring knee issue for some time now, but that doesn’t mean his mind isn’t as sharp as ever. That said, readers likely aren’t coming to the Scudder series for action (not that Scudder hasn’t dealt out some physical justice in the past). It’s the characters and their relationships that keep Block’s audience returning time and time again. The banter between Scudder and Elaine, Scudder’s internal dialogue and a few cameos make this one feel like coming home. 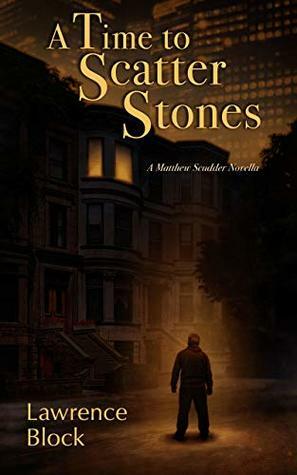 A Time to Scatter Stones is a worthy entry into the Scudder saga and longtime fans will be satisfied with this excellent, albeit quick, read.